Why it’s daunting: It’s hard to claim a band as popular as R.E.M. has a daunting discography. But the group has constantly shifted identities throughout its career, never settling too long in one place. While some signature elements have remained identifiable throughout R.E.M.’s career—Bill Berry’s lock-step drumming (up to a point, at least), Peter Buck’s jangly guitar chimes, Mike Mills’ sweet harmonies and melodic basslines, Michael Stipe’s distinctive vocals—the group has also continually tinkered with that sound, resulting in a sprawling discography filled with sonic shifts. Rising from indie label I.R.S. 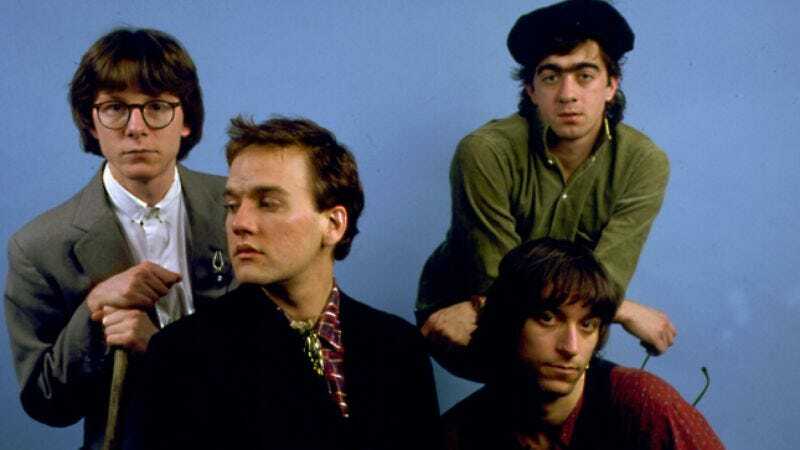 in the early ’80s to become one of the world’s biggest bands, R.E.M. has altered its sound as it saw fit over the years. After early success that culminated in the panoramic arena rock of the band’s 1988 major-label debut, Green, guitarist Peter Buck put down the Rickenbacker and picked up a mandolin. After those next two albums, Out Of Time and Automatic For The People, made the group critical and commercial darlings, Buck put the mandolin away and started using distortion pedals, and the band went in a hard-rock direction. R.E.M. has never had qualms about making these choices, and in some respects, it’s paid the price for it. After signing a five-album, $80 million deal with Warner Bros. Records in 1996, the band saw its popularity fade as founding member and drummer Bill Berry left and the remaining trio of Stipe, Mills, and Buck stumbled through uncharted territory in the late ’90s and early ’00s. They stretched their sonic muscles trying to find the right sound for this next phase, alienating fans who had jumped on board during the band’s commercial peak. Why: As with many obsessions, the best places to start are at the beginning and the peak. And the beginning was Murmur, a rock album as dense with Southern gothic atmosphere as the kudzu that graces its cover. From the first snare hits of the propulsive lead-off track “Radio Free Europe” through the nervous, kinetic energy of album closer “West Of The Fields,” Murmur immerses the listener in another world. Stipe’s famously mumbled lyrics remain a mystery to many almost 30 years later, but his voice is still able to evoke a range of emotions—desperation, sadness—even if the exact words remain open to interpretation. Elements like the tinkling piano on “Perfect Circle,” Buck’s jangly, circular line on “Talk About The Passion,” and the soaring chorus to “Catapult,” however, need no further explanation. Almost 10 years after the release of Murmur, Automatic For The People became one of R.E.M.’s bestselling albums and one of its greatest critical successes. Focusing on the themes of mortality and loss and featuring string arrangements by Led Zeppelin’s John Paul Jones, Automatic is a lush masterpiece. “Drive” opens the album on an ominous note, a subdued dirge that gives way to “Try Not To Breathe,” a shuffling rumination on dying. The album is also home to two of the band’s most-loved songs: the gorgeous, nostalgic piano ballad “Nightswimming,” and the country-tinged Andy Kaufman tribute “Man On The Moon,” which Peter Buck has called “the quintessential R.E.M. song.” While many of R.E.M.’s albums are cohesive, Automatic is one where the thematic elements and atmosphere combine to create an artistic work that, taken as a whole, is greater than the sum of its parts. New Adventures In Hi-Fi had the misfortune of following the loud, grungy Monster, which chased away many of the new fans the band had amassed with its quieter acoustic recordings. That’s a shame: All of the preceding elements feed into a record that summed up the sounds of the band’s middle period. Largely recorded on the road during the Monster tour, the album possesses a sense of weariness. Stipe’s voice is as raw as it’s ever been on “Binky The Doormat” and “Low Desert.” The glam-rock swagger of “The Wake-Up Bomb” and swimming distortion of “Undertow” sound cut from the same cloth as Monster, but better. The acoustic strum of “New Test Leper” and “Electrolite” could have come from the same sessions that produced Out Of Time and Automatic. But there are still moments when the band pushes itself toward new sounds: The epic “Leave” is a soaring rocker propelled forward by a keyboard siren sound, and the dirge-like “E-Bow The Letter” dabbles in Middle Eastern sounds—thanks to the use of the titular instrument— and features Patti Smith’s haunting backing vocals. Where not to start: It’s easy to dissuade fans new to the band to stay away from anything produced after Berry’s 1997 departure, but such a move would also be misguided. After all, despite some stumbles, there are plenty of moments on Up (1998) and Reveal (2001) that stand up next to any song from the band’s earlier catalog. That said, 2004’s Around The Sun saw the band settling into a creative valley, wallowing in a muddle of AOR songs. Songs like “I Wanted To Be Wrong” and “Make It All Okay,” limp forward, stuck in an overbaked mid-tempo rut that lacks the passion and vigor of earlier records and even the sonic experimentations of the two albums made immediately after Berry’s departure. Even the worst R.E.M. album has a bright spot or two (the simmering “Final Straw,” for example) but Sun best remains skipped. Thankfully, that ship has righted itself since with 2008’s Accelerate and Collapse Into Now, as the band has returned to an aesthetic that mixes in touches of its peak years and early days—stripping down essential elements and letting rip—creating atmospheric, layered, and beautiful songs.